Tirumala Tirupati Temple is accredited for being the most visited temple of India and second most visited shrine in the world after Vetican. Positioned on Venkatachala or Ventaka Hill (the seventh peak of the Tirupati Hill) in Chittoor district, Tirupati Temple is also the richest temple of the World. Dedicated to Sri Venketeshwara, the temple lies on the southern side of Swami Pushkarini. Tirupati Balaji Temple is accessible from anywhere in Andhra Pradesh. Tirupati has its own railway station that is connected with all the major cities of the country. The nearest airport to Tirupati lies at a distance of 10 kms in Renigunta. 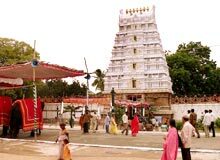 Almost every town and city of Andhra Pradesh offer regular bus services to Sri Venkateswara Temple. Tirupati temple forms the main part of the pilgrimage sites of the Hindus. Being presiding on the seventh peak of Tirupati Hill, Sri Venkateswara is also known as the Lord of the Seven Hills. The term 'Venkateswara' is more popular in southern part of India. However, the Lord is called as Lord Balaji too. He is regarded as the form of Lord Vishnu, who is considered as the preserver of this universe. The divine aura and significance of this temple attracts millions of devotees to its entrance, so long queues of pilgrims are not unusual. In Indian religious teachings, Tirumala Tirupati Temple has attained an exceptionally sacred position. The Scriptures like Shastras, Puranas and Sthala Mahatyams have acclaimed that the worship of Sri Venkateswara, is the only medium to get salvation (mukti), in Kali Yuga. Even, the pilgrimage to Tirupati is often suggested by the Rig Veda and Asthadasa Puranas. All these sacred writings boast about the sanctity of this pilgrimage, where Sri Venkateswara is regarded synonymous with the granter of boons. Like other temples of the Indian origin, Tirupati Temple also has a behind its establishment. Originated in Vaishnavism/ Hinduism, the temple observes the philosophy of equality, love and forbids sacrifice of animals. Many legends are believed to have visited this temple of great religious significance including Ramanuja Acharya in 11th-12th century. Several dynasties like the Pallavas (Kanchipuram), the Cholas (Tanjore), the Pandyas (Madurai) and the Kings (Vijayanagar) are believed to compete with each other to visit the shrine and offer donations. This ancient temple is supposed to have been standing since ages. Comprised of 'Gopuram' (tower), the temple is a fine example of Dravidian style of architecture. There is a gilded cupola (Vimana) by the mane of "the Ananda Nilayam" over the main shrine. The shrine comprises three enclosures, which are also known as 'Prakarams'. The outmost enclosure comprises the 'Dhvajastambha' (banner post) and the other enclosures have many statues including statues of King Krishnadevraya and Todarmal (minister of Akbar). The striking idol of Sri Venkateswara / Balaji lies in the main sanctum sanctorum of the temple. Till date, the lavish temple follows complex rituals and sermons of worship that were prescribed by Ramanuja Acharya in the 12th century. Every day, the program begins with 'Suprabhatam', which encompasses awakening of the Lord at 3'O clock in the morning. 'Ekanta Seva' is the last program, in which, the Lord is made to sleep at 1'O clock in the night. As per the day and period, different 'sevas' (services) and 'utsavams' (festivals) are held in the shrine of the Lord. 'Hundi' is a donation box and this is the main source of temple's income. Devotees offer donations as per their desire in these boxes that are kept at intervals in the temple. For the ease of the pilgrims, different 'darshans' including 'Sarvadarshan', 'Special Darshan' and 'Sudarshanam' are prearranged. Tirupati is another name of festivities, so with each new day, there comes a festival. Everyday, fair of pilgrims at the shrine add to the festivity of this temple. However, 'Brahmotsavam' is the most famous festival of Tirupati. This festival is celebrated on a grand level for nine days in September. Arrival of this festival increases the gush of pilgrims and tourists from the country. Depicting the Indian legacy, Tirupati Balaji Temple is really significant from the religious point of view. Every year, the popularity of this temple attracts tourists from all over the world. Sri Venkateswara is a benefactor of boons in the Dark Age and people come here to seek the blessings from the Lord.